Well, the Olympics are in full gear and Vancouver is a really fun place to be right now! Canada is in 4th place right now in the medal count with 2 gold, 3 silver and 1 bronze (behind the US, Germany and France). Congratulations to Alexandre Bilodeau, who won Canada's first gold on Canadian soil, Maelle Ricker (a native North and West Vancouverite who grew up on our North Shore mountains), Marianne St-Gelais, Mike Robertson, Jennifer Heil and Kristina Groves! Let's hope there are many more to add to the list! Our family may not have event tickets, but that doesn't mean we're not getting out and taking part in what's going on. 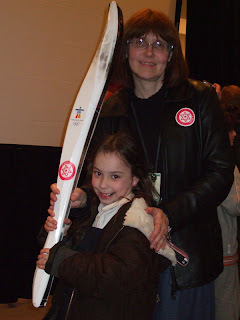 We had the opportunity to meet the Israeli athletes last week and Devorah and I had our picture taken with an Olympic torch that had been used earlier that day! Now, there's a once in a lifetime picture right there! Doesn't Devorah look proud? The red and white emblem you see on the torch and my jacket is for Canadian Magen David Adom, the organization that sponsored the evening. They're the Jewish equivalent of the Red Cross and the group raises money to buy and equip ambulances in Israel. On Monday night we headed down to Yaletown to see Matisyahu, whose song "One Day" is the Anthem for these 2010 Olympic Games. He was performing at CityStage, the big open-air venue at David Lam Park and it's lucky I had Michael's red stick umbrella with me! We stood in line for over an hour to get in and then for about the same amount of time inside while it rained the whole time. It was still great and we caught the evening's fireworks display too! An Umbrella for Valentine's Day?